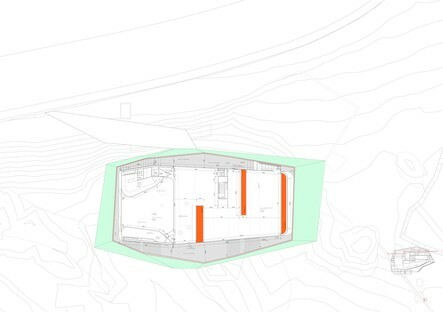 Selgascano’s conference centre and auditorium underlines the division between the built and natural environment where the western suburbs of Plasencia meet the countryside of Estremadura. 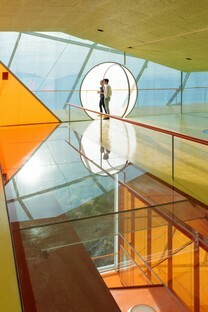 Selgascano’s project is an ETFE bubble which is largely built overhanging its base to minimise land use. Selgascano is one of the most enigmatic, reserved and unpredictable studios on today’s architecture scene, and came into the public eye with an installation at London’s Serpentine Gallery in 2015. Back in 2005 the studio won a competition to design a new conference centre and auditorium for the town of Plasencia in Estremadura, Spain, but subsequent financial problems meant that the work was not completed until much later, opening in June 2017. 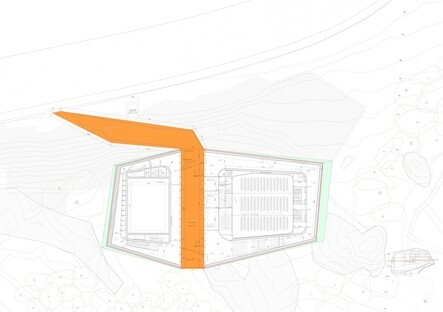 The Spanish architects were asked to design a building on the edge of the urbanised area northwest of Plasencia, but they immediately became interested in the opposite side of the lot, where the wild natural landscape of Estremadura extends as far as the eye can see. 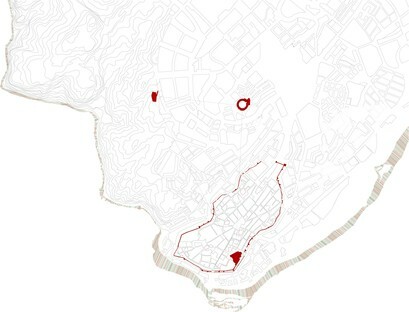 Famous for their ability to focus on the specific features of their site, often taking the form of an attempt to minimise impact on the land, architects Jose Selgas and Lucia Cano created a boundary work, belonging to the human, artificial world of built things, in terms of the materials used and the building’s overall impact, and the natural world, in terms of the delicacy with which the construction rests on the ground. Observing this temporary-looking construction as we rush along the highway to Salamanca, the former Roman road of silver and the future Silver Motorway, we get the sensation the building does not attempt to blend in but proudly stands out from both the uncontrolled urban expansion of Plasencia and the wilderness of Estremadura. Lucia Cano describes it as a stone suspended over the landscape, that could fly away at any time. 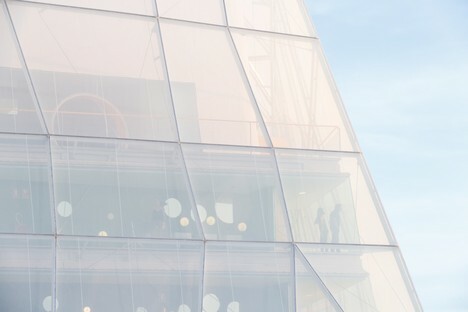 The colourful plastic element that appears so frequently in Selgascano’s projects appears in this project, too: the architects use a skin made of ETFE, a well-known clear polymer with a high energy performance which is extremely strong and lightweight, capable of withstanding thermal stress and chemical aggression. The linguistic factor is never separate from reflection on environment, so that their architecture is always an example of the best available research and technologies. 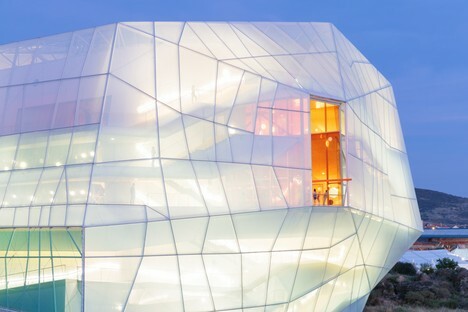 The metal structure supporting the series of ETFE panels wraps around a volume of concrete and wood: “skin and bone”, as Selgascano says, in which the flexible, ethereal component is grafted onto the solid, heavy one. 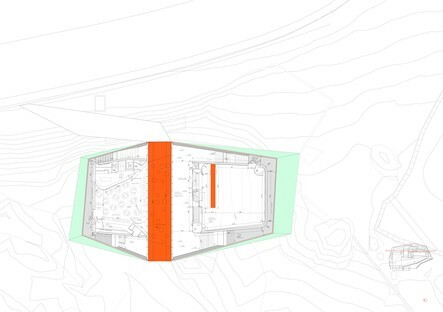 The lightweight materials they use also include orange honeycomb sandwich panels in the entrance hall running right through the building, from the top of the ramp connecting it with the street to the opposite side, offering a view of the countryside as far as Sierra de Gata. 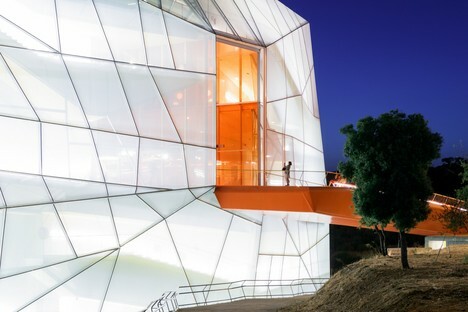 The architects of Selgascano imagine this auditorium as a big door (brightly lit up at night due to the transparency of the ETFE) which can be seen as either joining or separating the urbanised land to the east and the completely natural environment to the west. When the architects realised that the new buildings of no particular quality in this outlying part of Plasencia had concealed the natural lay of the land under an embankment 17 metres high, they decided that their project would be positioned at a level of -17 metres, occupying as little land as possible. 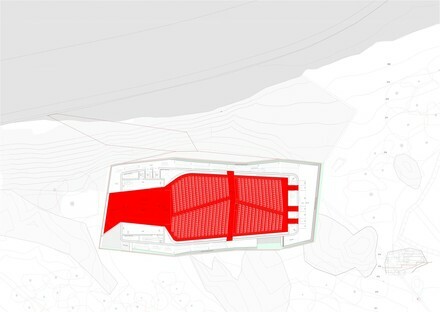 The cross section reveals how the Plasencia conference centre rests on the land only in the part occupied by the auditorium stage and part of the seating area, while the rest of the volume overhangs its base. 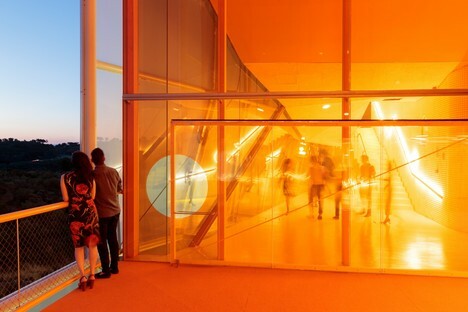 To overcome the significant difference in level compared to the entrance on Via Luis Velez de Guevara, the architects created a suspended walkway, coloured orange, like the hall it leads to. 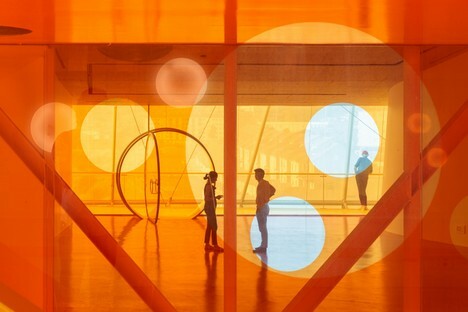 Immersed in a space dominated by transparencies, bold colours and organic shapes, visitors see the landscape from a space that is completely different to it. In the distance, the building looks like a blue balloon tied to the ground by its orange string. It cannot fly away, but it looks as if it is about to. As if it didn’t really belong to the place where it stands, but were a temporary element, transparent and weightless, ready to disappear at any time.